Great advice - I buy used on almost everything else - why not this too? What the heck, I'll start shopping today - love Craigslist! How many cords/winter do you burn in your area of the country? Was watching a show on an Alaska family that burns 1 cord/month all winter! Now that's a bit of work! Not an electronic pilot powered by the grid, a piezeo (sp?) electric lighter like they have for outside gas grills. No sense in wasting my matches either. One other thing I forgot to mention with a two stove system, you can take coals from the heating stove to get the cooking stove started quickly. Last edited by Mad_Professor; 04-13-2014 at 05:54 PM. I'd suggest anyone get a flint striker like one uses to ignite your cutting torch. That may be the spark that saves your life. I don't have money to spare to pay for a fancy stove ignition. The striker works great if using gas. If times get rough and we don't have electric, then we'll surely run out of propane too so best be prepared with wood stove and I'd buy up a good supply of strike anywhere matches and keep them in a good, dry, mouseproof container. Those strike anywhere matches are sure hard to find! Over the past several years, there has been a product on the market that has been called "ferro cerium rod" and it is essentially the same as a flint stick. You scrape it with a piece of steel and it sends a very hot spark...hot enough to start the magnesium chips you carve off the other side to make a very hot fire start. No matches, NO electric (which does need at least batteries.). I have started fires in the wet conditions of a night rain storm and done OK...wasn't fun but it did work. You can buy this in a variety of configurations and I may have mis-spelled it but it is close enough to get it found on the web. There are a lot of fire starters with a magnesium rod and this ferro cerium rod. These will outlast any number of boxes of matches and doesn't care if it gets wet! O yeah, don't forget the vaseline and dryer lint...that helps a lot too! I dream of having one of those. Beautiful stove you have. They're in every grocery store and Dollar General I've been in. I have a nice supply of english flint nodules and knap my own for arrows and rocklocks, and use the scraps with high carbon steel to make fire. 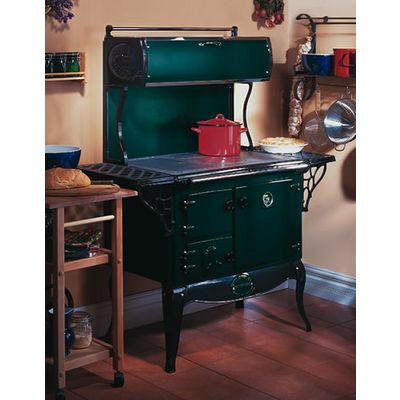 After this past winter my husband has been lusting for a Pioneer Princess cookstove for the kitchen. Apparently this stove will keep a fire all night long. Have any of you ever used this model? Sounds like I'd better grab them up before they disappear. I was at Menard's and see they have them too. I know this thread is very old, but thought I might add my 2 cents. When I was a boy (45 years ago) My grandmother had an older Monarch cook stove. She almost always used corn cobs for fuel. We would also add one 2" diameter elm log to hold coals. The house was in South Dakota, and the stove provided a lot of nice heat, but it would not hold a fire in the night. The house furnace was a gravity flow wood burner as well. And yes, it did get mighty chilly in that old two story farm house in the dead of winter. That cook stove is now in a summer kitchen at our local history center. I used it last summer. It still worked great. But here is some information which might be helpful. I made pickled beats last summer on that cook stove. I was using wood for the fire - it was dry, and I split it into about 1 inch pieces. Even still, the amount of heat at the burners, was only about 2000 BTU (VS 10,000 on the gas stove, which I normally use for canning) So it took a tremendous amount of time to bring my 23 quart pressure canner up to 15 pounds of pressure. It took 3 hours. This was just to cook the beets. Once the beets were cooked, I let them cool, and was able to peel and slice them. Then I put them back into the pressure cooker to can (5 pounds of pressure for 10 mins). Again it took half of forever to get the canner hot. I did manage to can 28 quarts, but it took me 10 hours to complete the task, and I was using 2 - 23 quart canners. The next day, I baked zucchini bread in the oven. It does have a thermostat, which still works, and is accurate. Again, it took over an hour, to get the oven up to 350 degrees. And then I was able to maintain that temp by using 5 corn cobs every 3-4 minutes. I remember my Grandmother had this wood cook stove and an LP stove in the kitchen. The LP stove was used in the summer, while the cook stove was used in cool and cold weather. A cook stove can produce a lot of heat, I remember having the kitchen over 80 degrees in the middle of winter, but I was a board kid, and I had nothing better to do, than shovel dust pan after dust pan of corn cobs into the stove. So the fuel you use makes a difference (wood, cobs, coal), but the warm up time (as pointed out earlier) is not something to be ignored. Also once a stove is hot, it does not cool off in a matter of minutes either. The old stove now needs some work. The water reservoir no longer holds water. I do know a person who is willing to weld up a stainless steel tank, but I'll have to get the top off, and get the rusty old tin tank out. Also the grates are pretty burned up, but they still work. I plan to get the new water reservoir made. But getting those bolts out, may be an issue. Also I've heard there may be asbestos in the stove, so I'll have to wear a good respirator when I do this. Excellent observations and personal story. My Father grew up in a very cold drafty house in SD, your point regarding that brings back quite a few memories that he has shared. When we had our wood fired cook stove we also had a small apartment size propane stove. The cook stove was run constantly except for July & August. For canning you are exactly right - along with boiling water quickly for something - the gas stove was used. I have envisioned many times how I would like to have a 8x10' or so size shed that I could have an outdoor kitchen in.. Room for the stove and a little wood .. Option #2 would be a propane kitchen range... Something to keep the heat out of the house when appropriate.. And use in power outages..
A shed that size on skids would be easy enough to move with the tractor.. Yesterday and today, my nephew and I decided we would fix up the old cook stove (see post above). It was a little work getting some of those old stove bolts out. We broke off only 3, which isn't too bad, considering that stove was made either in the 30s or 40s. As we too pieces off, we were careful to lay them out in the order and orientation in which they fit. But we were successful, we got the old water reservoir out, but in the process of having the cook top off, we discovered one of the castings in the fire box was not only broken, but a huge piece was missing. So after a lot of wiggling, we got that broken piece out. A friend of ours owns a welding/blacksmithing shop. He will make a new stainless water reservoir (the old one was copper), and he will either weld in some cast iron, or bolt on some steel plates to the casting that is left. Either way, it will again function. This year, when I demonstrate the use of the stove, I hope to be able to have hot water, for washing up the dishes. It's been interesting so far. I'll be sure to take pictures, when we start putting it back together.
. He will make a new stainless water reservoir (the old one was copper), and he will either weld in some cast iron, or bolt on some steel plates to the casting that is left. Either way, it will again function. Curiosity question - Do you think there will be much of a difference between the copper reservoir and stainless, regarding heat sink and stuff? Using a Wood Cook Stove in the Deep South. I may not have found and read all the old post on wood cook stoves, but they interest me and I want to get one we have serviceable, for just in case. We never had a wood cook stove when I was growing, but I knew several families who had wood cook stoves and used them. Warmth from a wood cook stove, was not that desirable here in the deep South, especially for about eight months out of the year, although in the dead of winter it may have been welcome for a short span of time. Not every family with a wood cook stove, had the cook stove separate from the main, living area of the house but most did. Typically the house would have a fireplace or wood heater and the living room & bedrooms would be in a cluster and then across the "dog trot" or breezeway would be the kitchen and dinning area. Not all, but in most the wood cook stove would be about three feet from the wall which the stoves back faced and centered from the two side walls. The walls on each side of the stove would be lined with windows as often would also the wall which faced the front of the stove. The kitchen & dinning room most often had no overhead ceiling so the heat from the wood cook stove could rise higher in this room. More affluent families might have counter tops for preparing foods for cooking, along one or both side walls to either side of the stove, while those of less means the dinning tables served the dual purpose as food preparation and dining both. During the winter the windows would all be down, but the balance of the year the windows would all be up for ventilation and an aid in keeping the kitchen and dinning area comfortably cool from the wood cook stoves heat. Again the more affluent families might have a ceiling fan over the dining table or had installed a window fan as those instruments became available. Back then no one had ever hear of double or triple insulated stove pipes, so much of the kitchen heat was emitted from the thin non-insulated chimney pipe. There was little need to worry about creosote build up, because the thin stove pipes burned out or rusted through so quickly they had to be replaced every couple of years.